Americans are drowning in debt, and they need more of a lifeline than witty little figures of speech can offer. At Atlanta Retirement Partners, we know full well that mounting debt can hinder hopes for the future. In this article, we’re going to give you more than just glib catchphrases and trivial observations: here we intend to provide useful tips to help you get a foothold towards regaining control of your financial life and restoring your hopes for a secure financial future. Debt is the classic elephant in the room situation: nobody wants to talk about it, nobody wants to even look at it, but it’s too big a problem to ignore forever. The good news is, there’s a solid chance the tools you need to tackle it head-on and take control of your finances are within reach already. Archimedes famously said, “give me a lever and a fulcrum on which to stand, and I can move the Earth”; while it’s doubtful the ancient Greek could have lived precisely up to his boast, it’s historical fact he could achieve seemingly impossible goals with a bit of knowledge and the right application. You too can lever yourself out from under the weight of debt – all you need is to know where you stand and how to push. Good debt is debt you’ve invested in your future. It can include your home mortgage, education loans, business loans, and other forms of debt that will reap dividends in the future. Bad debt, on the other hand, is where you’ve spent money you don’t have with no hope of recompense, usually with steep interest fees attached. Loans and credit cards with high interest rates are prime examples. So now that we’ve laid out the situation, we’re going to delve into a step-by-step guide on how to better manage your debt. First, perform a personal debt audit. You need to know exactly who you owe and how much you owe them. Organize a list or spreadsheet of all your accounts, how much you owe, and what minimum payments are due. Consider using a free credit report service like Credit Karma to help you put everything together. Next, create a monthly bill payment calendar. This will help you keep your bills paid on schedule every month. Try to make the minimum monthly payments on every account, but whenever you can, pay off your credit cards in full to avoid interest charges. Now it’s time to start taking a sledgehammer to your debt. Decide which debts to pay off first. There are two different approaches you can take with this, both of which require you to make the minimum payments on all your accounts. The “snowball” method suggests ranking your debts in order of account balance: start by working to pay off the smallest balances first, then work your way up to the larger ones. Alternately, “debt stacking” suggests you attack your debts in order of interest rate instead: pay off the accounts with the highest interest rates first, then work your way down. Build an emergency fund to fall back on. You don’t want to spend all this effort climbing your way out of debt only for an emergency to send you spiraling back into it. Start small: work towards setting aside $1,000 in emergency savings, then move your goal upwards to $2,500. Make a monthly budget and stick to it. A well-planned budget is your roadmap to financial success. Making a monthly budget and sticking to it is a great way to ensure you cover all your expenses and meet your savings goals. As you reduce your debt, you need to save for the future as well. Build a nest egg with the proceeds of your efforts. 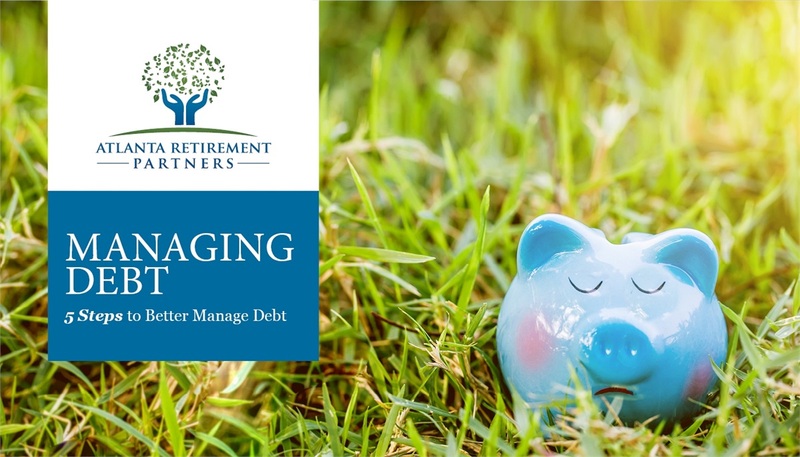 Clearing away past debt is only half the battle for your financial future: the other half is managing your day-to-day spending habits. Here are some quick rule-of-thumb tips to help keep you from accidentally plunging into debt in the here and now. First and foremost, calculate your gross monthly income (the amount you make per month before deductions for taxes and benefits). Mortgage payments, including taxes and insurance, should not exceed 29% of this figure. Car payments should remain under 15%, and total debt payments should not exceed 36%. Taking control of your financial life requires you to not only manage debt but to look toward saving for the future as well. It can seem like a daunting task, but it’s not only possible, it’s well worth the effort. There are plenty of resources out there that can help you through every step of the process: some might even be available through employer-sponsored financial wellness packages. At Atlanta Retirement Partners, people come first: we put our clients’ best interests ahead of our own and aim to help employees live more financially secure lives and reach retirement gracefully. 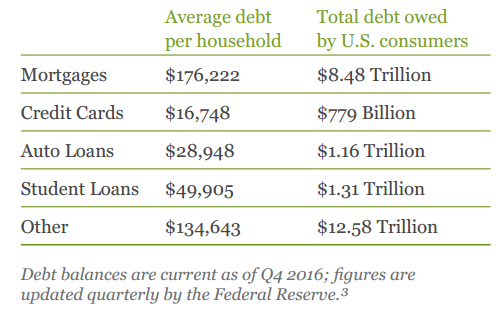 1 Pew Charitable “The Complex Story of American Debt.” July 2015. 2 FRBNY Consumer Credit “Quarterly Report on Household Debt and Credit.” February 2017. 3 FRBNY Consumer Credit Panel. “Quarterly Report on Household Debt and Credit.” February 2017. 4 Pew Charitable Trusts. “The Complex Story of American Debt.” July 2015.